Toronto After setbacks in its efforts to monopolize the cable and internet business, let’s take a look at how Comcast is faring. Their NBC/Universal subsidiary seems to be at the top of the pack, even as some, including our friends from Fox, are doing poorly. Blockbusters, it seems. In Philadelphia location of their world headquarters, they seem have learned little and continue to stub their toes though. Sometimes from the thin air of the executive suites it is probably easy to forget that way down there are the little people who have to buy the service and pay their bills to keep you in your perch. In Philadelphia, Comcast is up for renewal on its 15-year cable franchise, and consumers are clear that they are not happy with the shoddy service from the company, and many continue to raise their voices about the half-hearted, lackadaisical way the company has extended internet service to the community and ignored the FCC order to do so as a condition of merging with NBC/Universal. Hollywood may be happy, but Philadelphia is not feeling the brotherly love for Comcast. As the fight heats up, Action United, a partner in our efforts to push Comcast to actually deliver on its so-called “internet essentials” program of providing service to lower income families for about $10 per month and access to inexpensive refurbished computer. In a campaign called “Cap Comcast” the organization has been rallying support and calling on the City Council to use all of the powers in its disposal to require Comcast as a condition of any franchise renewal to have to finally hear what its customers are demanding. A wider coalition including Action United has also found that Comcast once again is using dirty tricks to try and get its way. Earlier in the summer they uncovered and exposed a “push poll,” common in politics to try and sway voters, was being pawned off as an objective “survey” of 1000 people to influence the council. The demands have been that Comcast make real contributions to the community and donate to schools and city services some of the millions it is saving in tax abatements that its balance sheet proves are chump change for them, but are blockbusting the city itself. 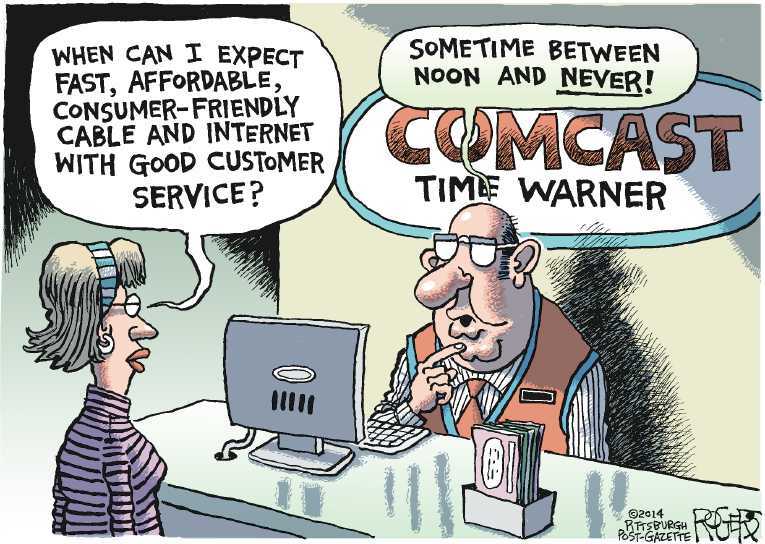 Comcast escaped some of the damage of this snafu once activists let out a holler, but it seems to be part of the standard pattern of the corporate arrogance by its management that rather than listening to its critics, as they continue to try and bully and posture. Comcast is unlikely to lose its cable franchise, but its poor record on providing internet and its horrible customer service ratings undid its merger efforts with Times-Warner. Activists and organizations in Philadelphia are in good position and swinging hard to force the company to make concessions that build the community for a change, and not just the company and its executive’s ambitions. I’m betting on the community against Comcast in Philly.